The latest study published in Future Oncology assessed the management of chemotherapy-induced nausea and vomiting (CINV), and addresses the major shortage of small-volume solutions and IV bags used to deliver treatment. These findings by Ottoboni and colleagues describe a potential alternative method of administration for CINV prevention. Aims: HTX-019 is approved for preventing chemotherapy-induced nausea and vomiting (CINV) as a 30-min infusion. Given the current shortage of small-volume parenteral solutions, administration via short intravenous injection is recommended. This study evaluated the pharmacokinetics, tolerability, and safety of HTX-019 administered by injection versus infusion. Materials & methods: Part A, a randomized pilot study, preceded Part B, a two-sequence crossover study of HTX-019 (injection vs infusion). Blood was sampled for pharmacokinetics and bioequivalence. Safety evaluation included treatment-emergent adverse events (TEAEs). Results: In Part B, 50 subjects received 2-min-injection and 30-min-infusion HTX-019 130 mg, which were bioequivalent and well tolerated; 8 subjects experienced 11 TEAEs (6 related) following injection, and 9 experienced 14 TEAEs (9 related) following infusion. 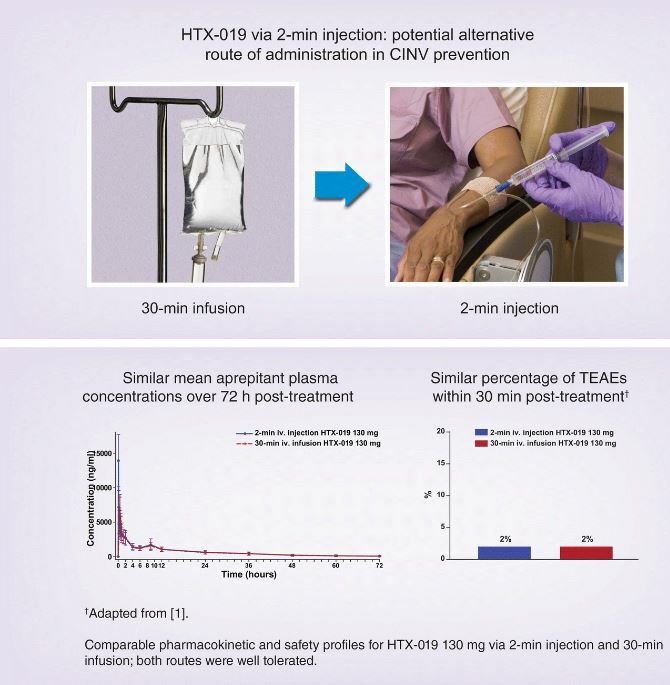 Conclusions: Pharmacokinetics and tolerability of 2-min HTX-019 injection support this potential alternative administration method for CINV prevention.